My Whirlpool Super Capacity 465 (RF380LXKQ) electric range is not heating properly. I used a digital meat thermometer suspended below the middle rack to check temperature. This way I could have the display outside while the door was closed. When set to a temperature the preheat indicator comes on and the oven counts down the time till ready. However when the time hits zero it is not at the proper temperature. If I set it for 400F it will only be 300F when the time ends. If I raise temperature to 415F it will eventually settle out around 400F. I tried using the Oven Temperature Control adjustment in the manual but the amount that it is off by changes with temperature. In order to get it to settle around 450F I had to have the oven set to 470F. Any suggestion on what the problem is / how to troubleshoot it? I really don't want to buy a new oven. 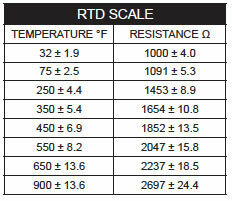 I would simply check the oven temperature probe against the RTD chart for the unit at trouble temperatures. The connection could also be coming loose causing a false reading. The stove appears very simple. Only the main E.O.C. and temperature probe control that circuit. Good Luck! Tech sheet for your model attached. Thanks. I was also able to search the web and find a service manual for it. Hopefully I am all set. I wil report back if it worked or not. I checked the temperature probe and its RTD values were correct. Check the connections at probe and E.O.C. to ensure they are stable. Some suggest to hard wire the probe to harness to prevent loose connections. Only other PART that could be at fault is the E.O.C.. How did you deduce the oven was not heating properly? Oven thermometers are very inaccurate and may be the culprit. I pulled the connector of the EOC (couldn't sneak the probes in with it plugged in) and they read the same as at the connector. They resistance values matched the ones on the chart for what my thermometer said the temperature was. So the meat thermometer appears to be correct. I first thought there was a problem when I noticed items weren't cooking correctly. Also when it said preheat was done I opened the oven and it didn't feel warm enough. Most ranges preheat by time not temp. When I sold Maytag ranges we used this as a selling point because the Maytags preheated by temperature. Any stove I ever checked temperature in needs 15 minutes to settle in. It used to be at temperature (or at least feel that way) after the preheat time. It is definitely cooler now after preheat than before. I allowed it at a set temperature until it stabilized and it wasn't at the set temperature. If set for 415F it would stabilize at around 400. To get it to stabilize at 450F it had to be set to 470F. I ordered a new control board. Hopefully that will fix it. When I first moved into the house the oven would trip the breaker if I tried to self clean it or run stove top and oven. I found that the pigtail was not correctly connected and was arcing. I think the surges from this may have damaged the control board.